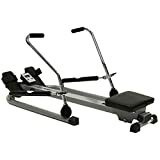 This Bentley Fitness Hydraulic Rowing Machine is a great piece of equipment to keep fit and healthy. This Rowing machine operates with pressured hydraulic cylinders to create resistance in a row motion. This machine can be adjusted depending on the users angle and Velcro straps provide stability on foot rests. Additionally this rowing machine has a electric monitor which can track the workout and padded seat which moves simultaneously when rowing allowing the user to experience a full body workout in particular it helps arms, chest, back, shoulders, lats and abs. Please note: Maximum user weight is 100kg.